CODAC Member Stephanie O. 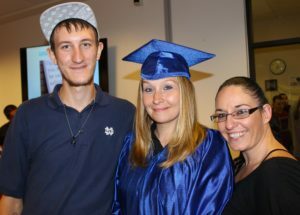 (C) celebrates her commencement from the Drug Alternative to Prison Program (DTAP) program. "It wasn't that many years ago that your drug of choice was your friend — then your best friend — then your only friend — then your worst nightmare," says Chief Probation Officer David Sanders to the fourteen graduates of the Drug Court and Drug Alternative to Prison (DTAP) programs on Wednesday, July 26, 2017. A room filled with friends, family, sponsors, and supportive community members celebrated this important occasion. Among the graduating group were three CODAC members completing their DTAP requirements. Programs such as this allow offenders to break the cycle of repeated incarceration by seeking intensive drug treatment alongside wraparound support services, which includes obtaining higher education, job training, transitional housing support, probation monitoring and regular court hearings. This allows members to address the root issues of their addiction, fulfill legal requirements and become productive members of the community. Since the program's implementation in 2007, there have been 400 graduates. Sanders states that clients involved in these programs stay in treatment longer than others and face a 40% lower chance of recidivism. Opening speaker and CODAC Peer Support Specialist Michael Kennedy is living proof. "Prior to joining DTAP, the only thing I could do for six years consecutively is a prison sentence," he shares. Michael was in the first graduating class of the DTAP program and now gives back to those affected by addiction through peer support. The three CODAC members who commenced from the program have also made significant strides in their recovery since starting DTAP. "This program has a treatment-first approach that has given them the opportunity to heal and grow from their past rather than face incarceration. All three of these women have successfully reunited with their families, have independent housing, and are giving back to the community," shares Recovery Coach Rebekah Sewing. A network of providers sets up clients for success. Through their own hard work, they are supported by a team consisting of their probation officer, treatment providers, attorneys, and judges. "Each of them worked hard each day to get to this point. It was a joy and an honor to be a part of their recovery journey," Rebekah says. 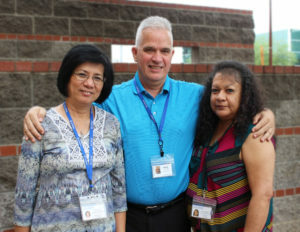 Employment Specialists Mitzi, Eddie and Laura support members with finding jobs. Maintaining employment is one of many stressors in a person's life, but this stress is amplified for a person also living with addiction or mental health disorders. CODAC's Employment Centers have compassionate staff dedicated to supporting members through finding employment while maintaining balance in their lives. "It is truly a blessing for me to wake up every day and be excited about going to work in anticipation of who I am going to help find a job today," says Eddie Crandall, Employment Specialist at CODAC's Alvernon site. To learn more about CODAC's Employment Center and services, click here. CODAC is partnering with Tucson Medical Center (TMC) and the Department of Child Safety (DCS) to provide treatment and support services to the families of babies who were exposed to drugs during pregnancy. This includes pregnant/postpartum women, spouses/partners, and their families. The treatment is convenient, compassionate and effective because it is offered at TMC where women already go for care related to their pregnancy. Meet with interested individuals at Tucson Medical Center. Conduct a thorough assessment of substance abuse, mental health, and trauma disorders. Every 25 minutes, a baby is born suffering from Neonatal Abstinence Syndrome (NAS). Often referred to as "drug exposed," these babies usually need to stay in the hospital for a period of time for monitoring and treatment. Research shows that being held and rocked by their parent can reduce the effects of withdrawal and improve healthy development. With substance abuse treatment provided by CODAC at TMC, the parent(s) and baby both benefit. The parent(s) can be near or with their child while engaging in meaningful treatment services. And the child can be near their parent(s), growing, stabilizing and forming the bonds that so critically impact their future development. When drug or alcohol use/addiction is discovered during pregnancy, the mother-to-be may need ongoing physical care to monitor the baby's development and vital signs in utero. 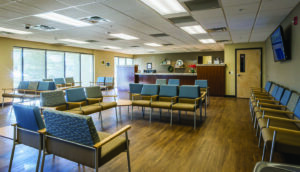 This testing and treatment can mean many hours at Tucson Medical Center. 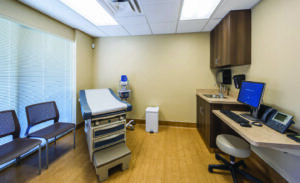 Now, it's convenient for moms and their families to participate in substance use treatment at the same location where they're receiving critical prenatal care. CODAC recently finished its first pilot session of an evidence-based curriculum focused on chronic disease self-management. The Chronic Disease Self-Management (CDSM) Group is a highly structured, 2.5-hour weekly workshop designed to provide education and resources for members who are struggling to manage their chronic physical and mental illnesses. This program provides engaging and interactive education for members to become empowered to take control of their health and well-being. At CODAC, more than 1,500 SMI members live with chronic illnesses in addition to their substance abuse or mental health diagnosis. The top physical medical conditions among members are hypertension, diabetes mellitus, obesity, pulmonary disorders and other neurological disorders. 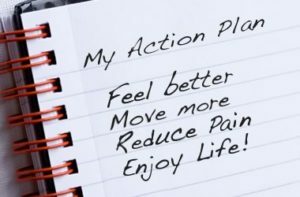 Of the ten members who participated, there were many positive outcomes, including increased healthy behaviors, improved physical symptoms, and better self-sufficiency when managing personal health. Ava reported never having "a good night's sleep." After using the problem-solving and relaxation techniques, she reported sleeping for more than six hours for the first time in two years. Laura had problems with managing her weight. She began logging her food in a journal and realized that she was over-eating before going to bed. After changing those habits for two weeks, she lost five pounds. Robert states that he was constantly thinking about drinking. Through learning how to change his negative thought patterns, he now practices thinking "I am proud of myself every day I don't drink" instead of "I want to drink every day." "The most important quality of this curriculum is self-management. Members are truly empowered toward self-determination. They all come out of the experience with a newfound confidence in themselves which thy can take with them wherever life leads them," says Population Health Administrator, Inge Detweiler. February is Black History Month and while we celebrate the many outstanding achievements and triumphs within the African American community, it is also important to recognize that there exists many ethnic health disparities among communities of color, especially within the African American population. These disparities highlight the importance of improving our health care system to make comprehensive and accessible treatment available to everyone. A total of 16.6 percent of African American individuals ages 18+ do not have a regular source of healthcare. Nearly half (46%) of non-elderly black adults who do not have health insurance report having one or more chronic health conditions. Nearly half of all African American adults have some form of cardiovascular disease. About every two of five African American adults have high blood pressure, with less than half of them having it under control. African Americans have higher rates of obesity than white individuals with 37% of men and 50% of women impacted by the disorder. The highest prevalence of asthma occurs within the African American population. Lack of early identification and treatment of cancer leads to higher incidence and mortality rates from many cancers and are responsive to treatment. Mental health disorders including major depression, ADHD, suicide, and PTSD affect African Americans. Socio-economic factors including the inability to afford health insurance, makes health care less available. Sources: "MH Disparity Stats." 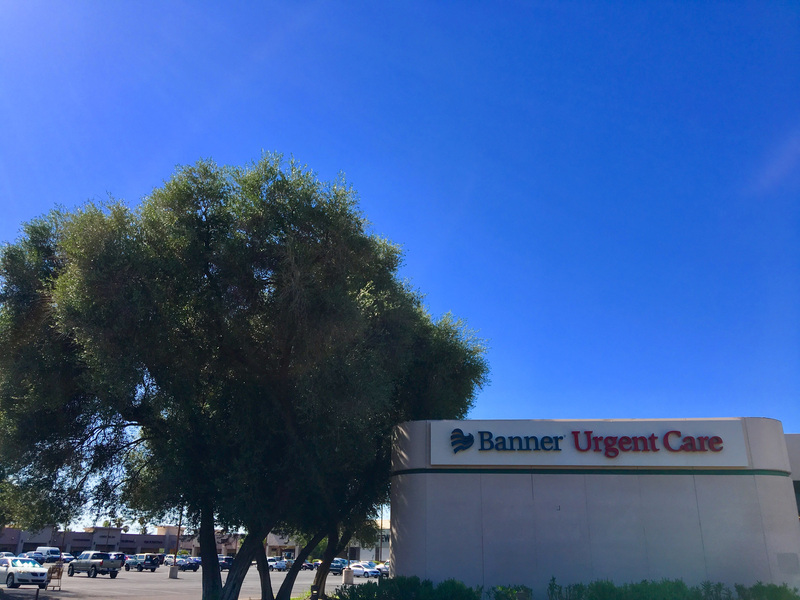 Cenpatico Integrated Care, Tucson. Accessed Jan. 2017. Angela Moore recognizes the importance of seeing the whole person when working in the field of recovery support -- not just a label. "There is more to my identity than being an addict," she says. For Angela, learning the value of her self-worth ignited the determination she needed to tackle a fourteen-year battle with drug addiction. 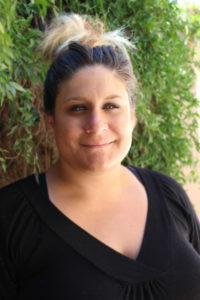 Now three years sober, Angela was recently promoted to Peer Support Supervisor at CODAC's Cobblestone Court site. 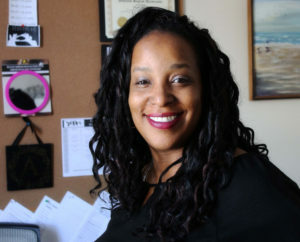 She oversees a team of six peer support staff and has the first-hand experience that allows her to excel at providing compassionate, trauma-informed support. "When you come for help or services, it is critical that you are able to connect with someone on an intimate level of having really understood your experience," says Angela. Her personal struggles with addiction, trauma, and homelessness are no longer barriers; they now create a pathway for open communication and a safe space to nurture and guide others who are in similar situations. Having been on the other side of that desk herself, Angela remembers what helped her the most when beginning her journey. "I learned many different tools from many different programs throughout that time and I never realized that I had to apply those tools outside of the recovery room. I learned from the other people who had years of sobriety," she says. Though she never intended to pursue a career in peer support, Angela shares that there are many rewards that come with this type of job. "There are times when I can see that a member is really listening and has absorbed what was said. You can literally see a shift in them when they really feel that they can change," she says. Angela is motivated by supporting members through these positive changes because she knows first-hand that change is possible. "Anyone can listen, but when someone absorbs what is being said to them, a seed is planted that recovery is possible for them too." Tippy Atkins, Recovery Support Coordinator, commends Angela for her tireless dedication to CODAC. "From day one, Angela has been so dedicated to this organization. It has been amazing to see her growth in such a short time both professionally and personally," says Tippy. Angela is a proud mother to her ten-year-old daughter Lexi. She is a licensed nail technician and enjoys being creative with fun nail designs when she isn't working at CODAC. Angela enjoys watching cartoons as a form of self-care and stress relief. Her personal favorite is "SpongeBob SquarePants." Arabella gives her mom a high five after completing their final Celebrating Families! activity with father, Robert. 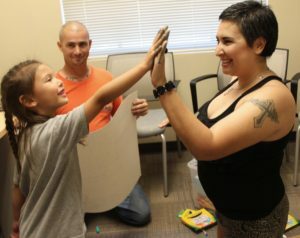 On Tuesday, May 17, six families participating in an innovative treatment program celebrated the conclusion of its first curriculum cycle. Celebrating Families! is a 16-week Evidence-Based support group model for children and parents in families that have problems with drugs and/or domestic violence. The curriculum engages every member of a family through interactive and age-appropriate materials. This program was piloted through collaboration with the Men's and Women's Recovery Services programs, Cactus Bloom and Child & Family Services at CODAC's Broadway location. "The teamwork of our programs to offer this to participating families was an amazing opportunity," shares Dan Krepps, Program Coordinator for Men's Recovery Services. Each session included a shared family meal and was followed by break-out sessions led by CODAC facilitators. Topics included healthy living skills, communication, expressing feelings, managing anger, decision making, problem solving and goal setting. The families would then assemble together as a whole to exchange dialogue about what they learned and discuss how to apply these skills in their daily lives at home. Program participant Veronica C. shares that her family learned many valuable tools that strengthened their resiliency and bond. "We have learned how to establish healthy boundaries, praise our children, have learned more patience and are even eating and sleeping better," she says. "Parents embraced the curriculum and the possibility for change... The children came each week with enthusiasm and a willingness to learn and share," says Dan. Objectives of the curriculum include breaking the cycles of chemical dependency and violence/abuse in families, decreasing participant's use of alcohol and other drugs, and positively influencing family reunification by integrating recovery into every-day family life. "It was inspiring to see the families bond and grow as one." The next Celebrating Families! session will begin in mid-July. To learn more about the Celebrating Families! Contact Dan Krepps at dkrepps@codac.org or Kelly Irving at kirving@codac.org.